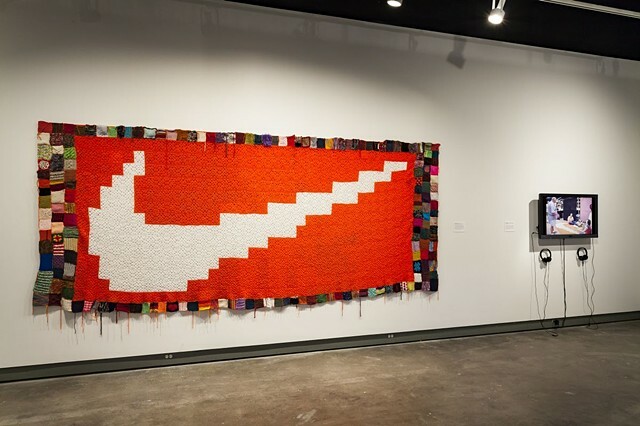 Cat Mazza: "Nike Blanket Petition"
From 2003 – 2008, a diverse group of international knit and crochet hobbyists participated in the microRevolt project—the Nike Blanket Petition, a 15-foot wide handmade blanket of the Nike swoosh. Each 4 x 4 inch square creates the Nike logo, acting as a signature for fair labor policies for Nike garment workers. Over the five-year period, “anti-sweatshop” squares were stitched into the quilt—representing people petitioning from over 30 countries. Squares accumulated from microRevolt workshops and exhibition tours, though many were donated from global knitting circles by post-mail.